Fiat Mode XXVIII was held in a new venue this year. Vancouver Community College (VCC) offered their annual fashion showcase on the runway at Vancouver Fashion Week (VFW). 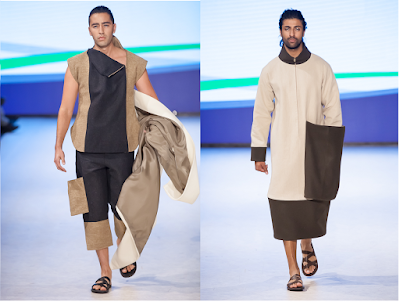 This year there were 24 graduates featured, each showcasing five looks - 120 looks in all. What an amazing opportunity for this strong class of design students to be a part of an established fashion week - and how daunting. Their collections would be evaluated by more than just a supportive group of family and friends. The audience also held a wide range of media and industry professionals there so see a wide variety of shows. I am sure there were a few nerves backstage. With a group this large, it's impossible for me to feature every student. 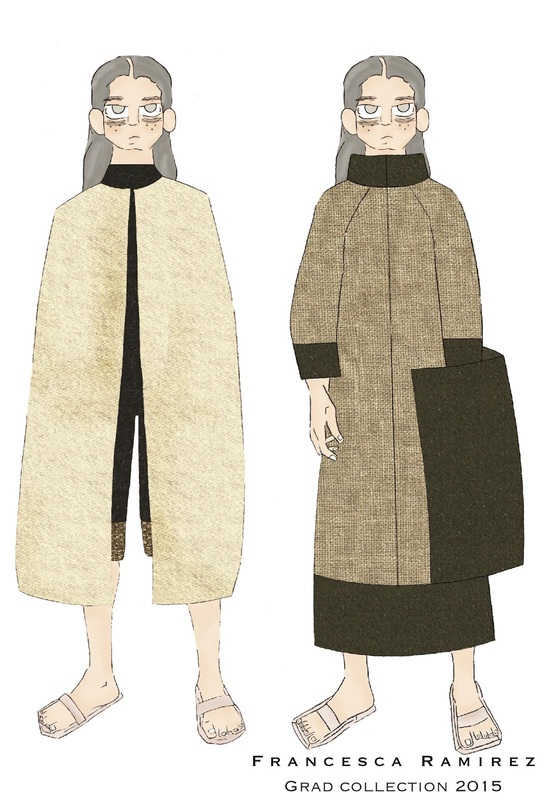 I have written a show overview for Metro Living Zine offering the collections of ten students selected by looking at both their runway garments and the fashion illustrations in their portfolios. From those ten I have chosen three to offer individual spotlights here. Today's interview is with Francesca Ramirez. 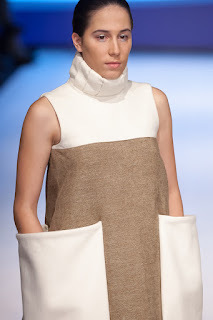 Her genderless, avant garde collection was a great example of the beauty found in strong, clean silhouettes. Proportions and details were well thought out, designs were intriguing and the palette/fabric chosen were good vehicles to show off the designer's structural aesthetic. Silly, I've always been known for trying to make others and myself laugh at anything and everything. I was a pretty boring kid in high school. I didn't have any interests but napping, until my last two years in high school. I loved spending lunch hours in the textiles room on my own. Looking back, can you remember any signs that you would end up in fashion? A personal story would be great here. I have always enjoyed creating things. It didn't matter what it was but I loved planning out a project from beginning to end, and finally completing it was always so satisfying to me. That’s probably why I love fashion design so much. The entire process from designing a garment to producing it is really gratifying and you always learn something new during the process. 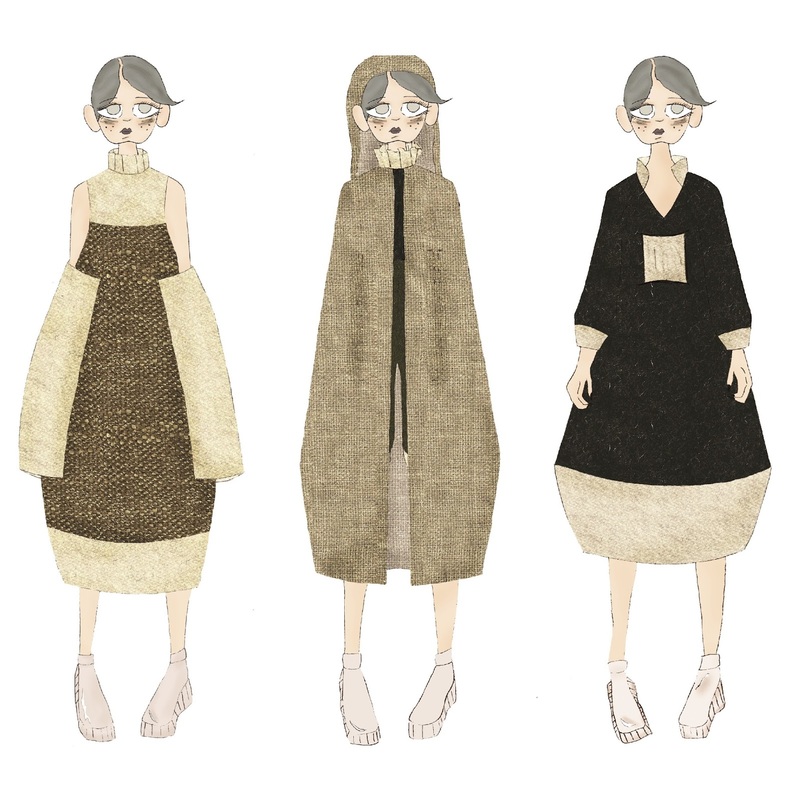 Talk about when and how you decided to study fashion design. Was you family supportive? It was kind of an accident as awful as that sounds. I wanted to take a class with my friends in grade 11 and the only class that had enough room for us was a Textiles 10 course. After sewing up the first project, which was a pair of pajamas, I realized how much I really enjoyed the entire process from looking at fabrics to sewing up a garment. Once I went on to grade 12 I was in Textiles 11. I realized I would never get to take Textiles 12 while I was in high school so I began to research for further education in fashion design. Yes, my family is incredibly supportive in my choice of study and career. I was kind of shocked to see the extent that they went to in order to help me plan my future in fashion design. I wanted to take my studies abroad so I went with my father and sister to L.A to look for fashion design post secondary institutions. After some research I compared other courses to the ones at VCC and decided to stay in Vancouver. It was also much more affordable than moving away while studying and being unemployed. Why did you choose to study at Vancouver Community College? I heard that VCC was known for their "hands on" programs. The courses are based more on you actually experiencing and doing things on your own than just lectures and textbooks. After looking at their course outline I knew I had to go to VCC because they were teaching everything I wanted to learn more about. The instructors were incredibly helpful and insightful with each course. I'm very happy with everything I got to do and learned during my two years at VCC. Talk about your time studying Fashion Design. What was hard for you, what was easy for you, are they any high, low or funny moments you can share? 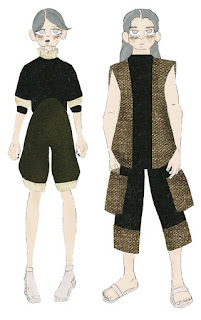 Studying Fashion Design was nothing like what I expected it to be. I had many sleepless nights and jam-packed stressful weeks but I enjoyed every minute of them. It's definitely something you have to love and be completely dedicated to. You don't really have time for anything but school and sometimes it feels like you won't have enough time to complete your assignments with the hours you spend at school. It was definitely a challenge at times, mostly at the beginning of the program. You begin working on things you don't understand and you have no clue how you finished your assignments but after you put it into practice for the first time everything just clicks and makes complete sense in the end. I think the easiest courses for me were the ones that had anything to do with sewing because I enjoy it so much. I had two years of sewing experience before going into the program, which isn’t much, but I do think it helped me out along the way. There were a bunch of high, low and funny moments throughout the program. You see the same people everyday for seven or more hours five days a week. You live some pretty hilarious moments with them and they're going through the exact same experience as you so you know you're never alone. The funny days were whenever there was an exam or assignment due and everyone who walked into the room looked as dead and sleepless as you. In the end you grow close to each other and end up helping each other out all the time. Yay for friendship! My Collection was inspired by the inability to move from strait jackets and the history behind the tortures and environment at asylum institutions. I wanted to work with a dark and sinister inspiration to challenge myself and push myself to work out of my comfort zone and see how differently I would design. Describe your collection – customer, day-evening-sportswear-separates-casual-highend glamour-stage costuming-punk? My collection is design for both men and women with no intention of gender specification. It's not something you would be wearing all the time. I consider the majority of my garments to be avant-garde so it would take a pretty confident person to wear my designs out on a regular day. I used a pretty neutral and earth tone palette for my fabrics. The majority of fabrics are natural fibers and upholstery fabrics, I used the stiffness and thickness of them to my advantage and created peculiar shapes and silhouettes in my collection. The fabrics I used were a few colors of Melton Wool, upholstery Hemp Canvas and a polyester Horus Chenille upholstery fabric. I’m really happy with all my looks but I really like the first look I constructed. It’s a dress that has a high pleated collar with a cream wool yoke and large side panels to trap the arms. I think it’s probably because I had most trouble drafting the lower half of the dress shape that once I started sewing it I created a little bond with the garment as strange as that may sound. With my designs I try to create different silhouettes for the body. My designs show no importance to the actual body figure; the shape of the body is lost behind exaggerated proportions and large silhouettes. And like I said, my designs are for both men and women with no intention of gender specification. I believe these aspects of my designs will bring something different. I get a job! I want to start my own line but I’d like to work for someone else first. I think I’ll probably start a very small business of selling a few custom garments but nothing big just yet. Please share a quote on what fashion design means to you if possible? Check out my website and social media for more images and future collections. I love creative collaborations so feel free to contact me.